Cashmere is perhaps the most widely recognised of all the luxury fibres. The word cashmere derives from an old spelling of Kashmir, in the Himalayan regions of India and Pakistan. It is this region that is traditionally associated with the animal that produces the fibre. Cashmere is not the name of a particular breed, but a description of a goat that has been carefully bred to produce a fine downy undercoat. Many different breeds can produce a fibre which is cashmere- like to some degree; however, it is the Himalayan Mountain goat, that the precious premium cashmere wool fibre is obtained from. Historically, fine-haired Cashmere goats have been called Capra hircus laniger, as if they were a subspecies of the domestic goat Capra hircus. These particular goats have insatiable appetites, and are capable of consuming 10 percent of their body weight in roughage every day. In China the larger herds are constantly stripping the ground of vegetation and topsoil, and desertification is a mounting problem for the ecological landscape. In Patagonia however, with the help of the Wildlife Conservation Society, a cooperative of herders have developed sustainable methods of raising cashmere-producing goats without stripping the vegetation. Cashmere is prized for it’s exceptionally fine texture and is strong, ultra light, and soft. It provides a superior insulative function without bulkiness, and the fibres are highly adaptable and easily spun. Like wool, cashmere has a high moisture content that allows the insulating properties to change with the relative humidity in the air. It is however, weight for weight, warmer than wool. The finest Cashmere is obtained from the neck area of the goat. Cashmere goats produce a double fleece that consists of a fine, soft undercoat or underdown of hair which is mingled with a straighter and much coarser outer coating of hair called guard hair. In order to sort the fine underdown and be processed further, it must be de-haired. De-hairing can be a mechanical or manual process that separates the coarse hairs from the fine hair. After de-hairing and washing, the resulting cashmere is ready to be dyed and converted into yarn, fabrics and ultimately garments. In some regions, the mixed mass of underdown and coarse hair is still removed by hand with a comb that gently pulls tufts of fibre from the animal as the comb is raked through the fleece. This process results in collected fibres that have a higher yield of pure cashmere after it has been washed and dehaired. The long, coarse guard hair is then typically clipped from the animal and is often used for other non clothing uses. Animals in Iran, Afghanistan, New Zealand, and Australia are typically shorn of their fleece, resulting in a higher coarse hair content and lower pure cashmere yield. The traditional method of harvesting cashmere is hand combing. In Mongolia and parts of China this continues to be the preferred technique, as it results in a far better yield, as well as finer and softer fibres. Combing is usually carried out when the animal is naturally shedding its winter coat. Hand combing can take between one and two weeks to complete. The fibre is collected from the farmers and sorted by hand and eye in factories within the same geographic regions as the goats are herded. Efficient sorting is crucial to the production of cashmere, and the fibres are graded by quality and colour then washed to remove the coarser hairs, and any dirt and vegetable matter. Then the coarse outer guard hairs are separated from the soft under down which is the cashmere fibre used for spinning. The coat of the animal generally continues to grow in preparation for the coldest weather and is removed in the early to late spring depending on the method of harvesting. Some farming methods involve shearing the goats in early March and then ‘housing’ them indoors for several weeks before allowing them back out. This careful process ensures that the maximum amount of quality cashmere from each goat is obtained, since it is done just before the coat loosens naturally and falls out. Where the facilities to house the goats do not exist it is more common to comb or in some cases simply pull out the fibre. This has the disadvantage of having to be done after the coat has already begun to loosen and therefore, much of the fibre can be lost to the environment, but it does have the advantage of leaving the main coat, or guard hair, intact allowing the goat to continue to keep its own protection against the elements. This method also spreads the process out over a much longer period since the goats shed at different times and it usually requires two or three operations to remove all the cashmere. In Iran, Afghanistan, Australia and New Zealand the cashmere fibre is generally removed by shearing, which is a faster method, but results in a higher coarse hair content and a lower pure down yield. China has become the largest producer of raw cashmere and their clip is estimated at 10,000 tonnes per year. Global yield is around 20 000 tonnes. The three principal countries known for the most sophisticated and innovative cashmere spinning, knitting and weaving and which purchase high quality cashmere are Italy, Japan and Scotland. Alpaca is an enigmatic fibre which is valued for its fine, soft and silky characteristics. The Alpaca resembles a small llama, and is a domesticated species of the South American camelidae family. it is the principal South American fibre-producing animal. Alpaca’s are herd animals whose natural grazing habitat is high in the Andes, and today all alpacas are domesticated. Alpaca fleece has some similarities to sheep’s wool, but unlike wool its fibres have a minimal lanolin content, which makes it almost hypoallergenic. It is naturally impermeable, thermally responsive and has a low flammability point. It is a soft, durable, luxurious and silky natural fibre. It is similar to sheep’s wool, but lacks the prickle is warmer, less prickly, and Alpaca is naturally water-repellent and difficult to ignite. Its softness comes from the small diameter of the fibre, and is to merino wool. Its glossiness is due to low height of the individual fiber scales compared to sheep wool. Alpaca fibers have a higher tensile strength than wool fibers. The alpaca has a very fine and light fleece. It does not retain water, is thermal even when wet and can resist solar radiation effectively. These characteristics guarantee the animals a permanent and appropriate coat to protect against extreme changes of temperature. Although it feels soft to the touch, the hard surface of the fibre makes alpaca a very durable yarn. It has excellent thermal insulation properties with an apparent lightness of weight. There are two types of alpaca and one cross breed, and all three are highly valued. The Huacaya is an alpaca that grows a soft and spongy fibre, which has a natural crimp. Huacaya produce a dense, soft sheep like fibre with a natural uniform crimp, giving it a slight natural elasticity that makes the resulting yarn well-suited for knitting. These are the most common variety in both their natural South American habitat and in the Countries that have since imported them. The Suri have silky pencil-fine, mop-like locks, prized for their finer longer fibres. Their coats have far less crimp, which makes the fibre more suitable for woven textiles. Suris make up the remaining 20% of the population. Huarizo are an Alpaca-llama purposeful crossbreed. Fibre from the Huacayas is marketed as Alpaca Fleece, while the fibre from suris is marketed as Alpaca Suri. Alpaca fibre can range from 13 to 30 microns but should be below 22 microns to be considered a luxury fibre. Alpaca and its larger relative, the Llama, belong to the Camel family (Camelidae), and are found mainly in Peru and other areas of South America. Llamas have long been used as pack animals while the smaller alpaca was bred for its fleece alone. Llama hair is a little thicker but the fiber characteristics are similar. While more expensive, they have some significant advantages over sheeps wool. They are, for instance, 5-7 times warmer than wool, due to microscopic air pockets that trap and insulate; the fibres have no lanolin and so are hypoallergenic, and the fibre feels less itchy because the surface scales of the fibre lie flatter and smoother than those of sheep wool. The fibres are also very strong and durableAlpaca have been bred to have very little if any guard hair, the coarser outer protective coat that needs to be separated from the softer undercoat. The preparing, carding, spinning, weaving and finishing process of alpaca is very similar to the process used for wool. Alpaca fibres are processed in a similar way to sheep wool. They are sheared annually or in their native Andean habitat, generally sheared once every two years. Alpacas naturally range in colour from jet black through warm browns, fawns, cool greys to creamy whites at the lightest end of the spectrum. The large range of colours and shades is a special characteristic of the breed and hence colour sorting is highly skilled specialist work carried out by hand and eye, it is the most important part of the business. Depending on country of classification fleeces can range from between12 to 52 natural colours and shades. They are principally found in Peru and Ecuador with smaller numbers in the northern parts of both Bolivia and Chile. The United States - Canada - Australia - New Zealand has all imported alpacas and through more sophisticated animal husbandry and selective breeding are now producing heavier fleeces and finer fibres. In textile terms “Alpaca” refers primarily to Peruvian alpaca, which is marketed with a dedicated symbol of authenticity. Alpaca farming has a low environmental impact and is therefore an interesting alternative for some sheep farmers. Furthermore in their native South American habitat alpaca herds are less intensively managed than many sheep herds in the developed world. In addition the financial precedes from their fibre benefits poorer rural communities. The vicu�a is the smallest of the wild South American camelids. Vicu�a fibres are extremely warm and are possibly the finest of all the animal fibres, with a diameter of 6-14 microns. In the past the huge commercial demand for Vicuna fibre and unrestricted hunting had resulted in the species becoming almost extinct, and it was declared an endangered species. In the mid 1970s, as a result the trade of vicu�a fibre was prohibited worldwide. The conservation efforts of Peru, Argentina, Chile, and to a lesser extent Bolivia has led to a dramatic comeback of vicuna herds. As the vicuna population grew, all four countries relaxed the laws and sustainable commercial harvesting is now practiced, it is a cash crop that can benefit some very poor communities. Peru has taken the lead in vicu�a conservation; it has introduced a traceable labeling system that shows that a garment has been created through a government-sanctioned ‘Chacu’. Chacu is an Inca term for a ritual tradition where the animals are communally captured and shorn and then released back into the wild. They are tagged to ensure that they are not mistakenly herded again for another two years. The program ensures that a large percentage of the profit goes back into village community as well as funding further research into protecting the species to ensure the sustainability of the fibre. Recent crossbreeding with alpacas has resulted in offspring that are called Paco Vicu�a which has a coat that is as fine as that of the alpaca but with a longer fleece than that of the vicu�a. This makes the paco vicu�a easier to shear, and it can also be shorn annually rather than only once every three years. The outer guard hairs are easily removed from the shorn fleece. The wool is very sensitive to chemical treatments therefore it is always left in its natural colour, which is a rich golden honey. Italy is the primary global importer of Vicu�a fibre for yarn and fabric production. Camel hair for the commercial textile industry is obtained only from the Bactrian (two hump) camel. With the exception of some wild and feral camels, they are all now completely domesticated. Bactrian camels are native to China and Mongolia and are the source of the soft down associated with the finest camel fibres. The one-humped dromedaries are native to the Middle East, and these also supply fibres for textiles, but they produce less of the desirably soft undercoat because they live in warmer climates. Camels have been domesticated for over 3,000 years and have been primarily used as pack animals. They shed their coats naturally and the fibres are collected and separated. This down fibre is extremely fine, soft and warm. Unlike wool, camel fibre lacks the pronounced overlapping scales, and therefore does not felt very well. The fibre structure of camel hair is similar to that of cashmere and it also grows a down undercoat covered by an outer coat of long, coarse guard hairs. Camel hair, like wool has thermostatic properties that keep the wearer warm in winter and cool in summer. The fibres are typically between 15 and 22 microns in diameter. The production of camel hair is a five-step process of collecting, sorting de-hairing spinning and finally weaving or knitting. Combing and shearing, or natural shedding during the moulting season. The camel sheds its winter coat in clumps of both outer hair and inner down, which is still hand-collected. The second stage is sorting, where coarse hairs are separated from the fine soft hairs. It is then washed removing all dirt and debris. The third stage is the final de-hairing; this is a mechanical process to remove the balance of the coarse hairs, dandruff and any vegetable matter, before the raw fibre is spun. It is only the softer undercoat that is used for premium textiles, either as pure camel hair or blended with lamb’s wool. If it has been blended, usually the camel hair is likely to be of an inferior quality or possibly even re-cycled. The very best camel hair is from the underside of a Mongolian baby camel is said to be almost comparable to cashmere in softness. Camel hair is a golden tan colour with varying tones of red. Traditionally it is left in its natural colour, as this is part of its unique selling point, although contemporary developments in dyeing technology allows it to respond to dye as successfully as wool. The best quality hair producing Bactrian camels live in the extreme climatic conditions of Inner Mongolia in Northern China and Outer Mongolia. Other producers of camel hair include: Afghanistan, Iran, Russia and Tibet. The camel is not native to New Zealand and Australia but over the years they have been introduced to supplement the domestic fibre selection of these countries. World production of camel hair fibre is around 2500 tonnes. Mohair is the fleece of the Angora goat. It is a smooth and lustrous fibre with a high tensile strength. Mohair fibres have scales similar to wool, but these are larger and flatter, making the fibre appear smoother and more light reflective. Because of the underdeveloped outer scales, mohair does not felt as readily as sheep wool does. It is considered to be a luxury fibre, along with cashmere, angora and silk, and is usually more expensive than most wool qualities obtained from sheep. Mohair is also a warm fibre, as it has great insulating properties. It is durable, and resistant to moisture-wicking, stretch, flame and creasing. 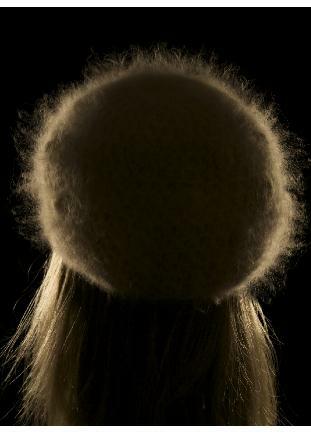 Good quality mohair fleece is made up of locks or ringlets of mohair fibre held in place by their natural curl. It has a light oil-like sheen from the natural grease called yolk and a good staple length. Goats need to be brushed and groomed regularly to ensure the best possible coat at shearing. Most animals produce a relatively coarse outer coat and a finer undercoat. The overcoat sheds rain and the undercoat provides insulation. Undercoats generally grow in for winter warmth and are shed in the spring. The angora goats grow three types of fibre; kemps, which are coarse, hollow, stiff and opaque fibres, medulated fibres, which are less coarse, and the true mohair fibres are found (as with other luxury fibres), in the animal’s fine underdown. The undercoat provides the finer quality fibres. The two fibre types must be separated at some point in the processing of the fleece. The undercoat dominates, so that relatively little coarse hair will be included in a fleece. Angora goats are not as hardy as cashmere goats and have very exacting demands; they require drier climates and can perish from pneumonia if they get wet or cold. They also have specific environmental and nutritional requirements; they like a variety of shrubs and need sufficient space for an active life. It is in the interests of productivity and quality that the environment is sustainably managed and the animals are well cared for, as the well being of the animal is reflected in the quality of the fibre harvested. In some climatic conditions an unshorn strip is left along the spine to protect the goat from catching a chill after shearing. 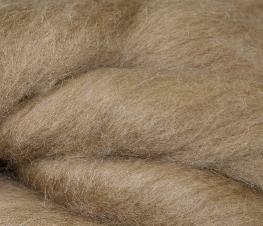 Mohair fiber is approximately 25–45 microns in diameter. Mohair increases its diameter with the age of the goat, growing along with the animal. Mohair should not be confused with the fur from the angora rabbit, which is called angora wool. Mohair is not the softest yarn, when compared to alpaca or cashmere, On the other hand, mohair is valued for certain unique characteristics: it is warmer than other fibres, even when used to make a light-weight garment, and it is often blended with wool for this reason. Mohair fibres have a distinctive lustre created by the way they reflect light. Pure mohair yarns absorb dye particularly well, and are usually recognisable for their vivid saturated colours. Mohair is shorn from the goat in the Spring and Autumn without harming the animal. The hair is then processed to remove natural grease, dirt and vegetable matter. Mohair is prized for its both durability and resilience. It is notable for its high lustre and sheen and is often used in blends with other fibres in order to add these qualities to a textile. South Africa and Lesotho produce over half of the total Mohair output followed by the United States. Turkey, Argentina, Australia and New Zealand also produce small quantities of mohair. South African Mohair is the most sought after, as the animals have been genetically selected to produce minimal amounts of kemp fibres. France, Italy, Germany, Portugal and Great Britain all produce mohair fabric. France and Italy also specialise in mohair yarn for knitting. The total global production of mohair is around 5000 tonnes, and represents only about one percent of global natural fibre production. Angora is the fibre from one of the oldest breeds of domesticated rabbit. There are two main types, the French breeds, which have more guard hairs, and therefore a spikier appearance, and the German breeds, which are almost free of guard hairs. Angora fibre has a very soft, silky texture and is prized for its ability to capture the light, lending it an angelic downy ‘halo’ –like appearance. The fibres themselves are usually 10 to 13 microns thick and also hollow, which gives them a characteristic lofty and ‘floating’ feel. For a superior quality yield it is important that the animals are well looked after and groomed carefully. Their long hair needs to be combed at least once every two days in order to prevent it from matting and felting. Angoras are Albinos and sensitive to light, therefore they are kept in semi darkness. Their wool can be harvested all year round, although it requires careful handwork. Angora rabbits can be nervous, and it is important to be gentle with them. The fleece can either be shorn or plucked. French Angora production usually involves plucking following a depilatory inducing injection. This method will produce finer fibres, but is unethical as it leaves the animal in a state of shock. The alternative and more popular method is to carefully shear the hair. Due to their fast hair growth they can be shorn three to four times each year. Angora fibers are short, and therefore usually mixed with other soft fibres, such as cashmere and lambswool. After processing and spinning the yarn may be used (as with other animal fibres), for blends and also to create novelty effects in woven fabrics, but generally angora is more popular for knitwear yarns. Angora is generally viewed as a luxury fibre, and most angora wool products are very expensive, which is reflective of the laborious harvesting process and the small number of cottage industry style producers. China currently dominates world angora production, and is responsible for over 80% of the 3000 tonne global yield. France, Germany and Chile are also important producers.